16:53 A stop, possible engine trouble? 17:35 Tea break right before a mountain pass, the scenery was beautiful and Yann and I strolled around only to notice an abandoned tank left over from the civil war. 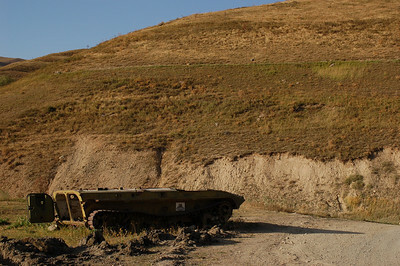 As we crossed the pass a few minutes later, signs warned of landmines covering the whole area. I first thought that they were signs warning of forest fires (yes I know, we're above the tree line) until Yann pointed out the stick figure above the flames with his leg being blown off. 20:30 Stop at cafe for dinner, Yann and I ate an entire pack of hot dogs along with some stale bread. The next part of the stop was by far the most frustrating part of the trip. First our driver announced to us that he was exhausted and needed a few hours of sleep before driving again, fair enough. We tried to figure out how long we would be stopped for, debating whether or not we should one of the (over-priced) tea house beds. No one, including the driver seems to know. After at least an hour of sitting around and eating, we are told that the driver will be sleeping for 2-3 hours, so, since we are also exhausted we settle into dorm beds. 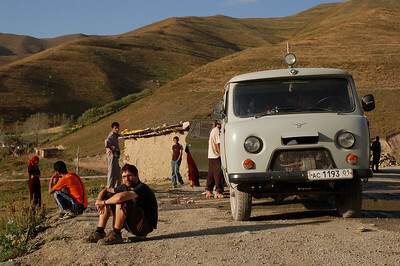 Ten minutes later we are woken up and told that we are leaving, heading straight to Khorog (our final destination). The rest of the passengers (annoying and now drunk) have bullied the driver into continuing the drive, because they do not want to pay. Not only was this annoying because we thought we would get a rest, it was annoying because we didn't think it was very safe. We didn't even bother voicing our opinion, even the driver wasn't being listened to. For the next 4 hours there might have been a few stops, but most passengers were drifting in and out of sleep, including me and probably the driver. The only person who seemed to be in an uncomfortable a position was Yann, who pretty much didn't sleep a wink. During this time we picked up 2 extra passengers, we were now 18 people in a mini-bus that was designed for 11. The minibuses are transformed by reducing trunk space and bringing the benches closer together, an additional bench is added, but facing in the wrong direction. So Yann and I sat across from each other, sharing the leg space for one person (which the lady beside us decided she would crowd with two watermelons). We were sweaty and overheated, with only a few small windows, the woman beside us didn't like the wind blowing in her face and we almost came to blows over keeping the window open, not to mention her ridiculous watermelons rolling around at our feet. And that, is how you average 24km/hr, we paid 40$ each for the pleasure. The 45 minute flight would have cost us 65$ each. So...you took the bus because? I can't believe it cost $40 bucks! It is costing me only $40 to get from NY to Ottawa for Thanksgiving and I probably get my own seat and only have to have my papers checked once! I guess you saved 15 dollars to tell this crazy story. Congrats on not killing anyone.